Sciatica-type symptoms are a common complaint from those who sit a great deal with long hours in a desk job. If you do not move a great deal (as taught in our Sit to Be Fit workshop), then you will be at a higher risk of sciatica entering your life. We thought that it was important to share our tips on how to manage sciatica-type symptoms. Sciatica is a horrid pain that radiates from the sciatic nerve in the buttock out into the low back, down the leg to the foot and if you're unlucky into the abdomen from the pelvis. It might feel tingly, that there is weakness or numbness. It feels worse when you are sitting, but the sharp pain can make it difficult to walk. The pain is constant only in one side of the lower limbs. There are some common causes for sciatica, but the pain will be excruciating whatever the cause. The first 5 our technical sciatica caused due to a disc issue, the bottom 2 are sciatica-like problems that need consistent and dedicated physical training. Lumbar herniated disc inner in the spine that pushes onto the nerves connected to the sciatic nerves. This may also be called slipped, ruptured, protruding or bulge. Degenerative disc disease where the disc slowly weakens and places pressure on nerve root areas. Isthmic Spondylosis is a small fracture where the L5 slips over the S1 and this can cause a pinching of the sciatic nerve. Lumbar Spinal Stenosis is most common in over 60s that appears with arthritis with overgrowth of tissues placing pressure on nerve roots. Pregnancy where the changes in your pelvis and angle of your lumbar spine changes the way that the facet joint presses in your spine, this causes sciatica pain. Piriformis Syndrome where the Piriformis muscle in the hip complex becomes inflamed due to overwork. The inflammation presses on the sciatic nerve and causes a similar sensation to sciatica, although is technically not sciatica. Sacroiliac Dysfunction irritates the L5 nerve and causes the same pain as sciatica. Medical advice is that you may need an MRI scan to confirm if the cause is a prolapsed disc. If physical therapy and retraining do not help, then you may need intervention. It is best to avoid this trauma to your body and use it as a last resort. You do not feel like you want to move, but you must! Acupuncture can help with the pain symptoms for the short term, but you will need to do the physical movement to get long-term relief. Even if you are waiting for your doctor’s appointment, try some of these exercises. Try to walk or swim each day alongside the below exercises. Pain should improve within 6 weeks. Whilst lying on your back, bend your knee into your chest. You can bend the other knee with foot on floor or extend it long. Breathe in a relaxed manner for 20-30 seconds. Each exhale try to draw the knee closer to your chest. Lie on your back with knees bent and feet on the floor. Keep feet on floor and take knees to one side. Keep shoulders heavy on the ground on both sides and turn your head the opposite way of your knees should you choose. Breath to the bottom of your pelvis to feel relaxation and release. Hold for 20-30 seconds on each side. Cross ankle over opposite top of knee. Draw the knee towards your chest. Keep your hips level and shoulders relaxed. Hold and breathe for 20-30 seconds on each side. To intensify the glute stretches and target the Piriformis muscle that often adds to the sciatic nerve pinching, this can be a great stretch. From the glute stretch position, add the lumbar twist position of the legs dropping to one side. The ankle leg will have the knee pointing towards the ceiling, and other knee towards the ground. Breathe and relax for 20-30 seconds on each side. From the hamstring stretch take your leg across your pelvis trying to keep both hips level on the ground. You can soften the knee as you feel the stretch down the outside of your thigh/hip/knee. Hold for 20-30 seconds and breathe calmly. Use a belt or rope around your foot for this exercise. Draw thigh towards chest & exhale as straighten knee. Keep your pelvis on the ground evenly weighted. Your leg must be straight & hips level to target the hamstring. The leg can be below 90 degrees if that is your range of flexibility. Seated on the floor. You can use a cushion to elevate your hips if this is very tight for you. Open one leg wide and bend the other foot into your groin. Gently reach sideways towards your straight leg foot, bending in your side waist. Hold & breathe easily for 20-30 seconds on each leg. Lying on your stomach with legs straight behind you. Draw your navel in as you lengthen your spine to lift head & shoulders off the floor. Hold 5-10 seconds in backbend trying to widen your collarbones and draw your breastbone forward. Stand with feet a comfortable hip-width distance apart, toes pointing forward. If possible place your hands either behind your head or under your armpits to remove them and focus on your legs. If you need help with balance hold onto a chair or have your arms out to the side. Lift one leg out to the side, keeping your toes pointing forwards. Pulse the leg out to the side hovering off the floor for 10 seconds. Try not to shift your weight onto the supporting leg or let your supporting hip push out to the side. Think of being tall and your spine staying in the plumb line centre of your body. See if you can do this 3-5 times on each leg. Often the bridge position can be painful in sciatica, but you want to get this muscle activating. Squats are great and functional too. If possible place your hands either behind your head or under your armpits to remove them and focus on your legs. Bend your knees and ensure they go over your middle toe on each leg. Bending only as deep as you can keep your back in a straight line and knees over the middle toe. Feel your sit bones wide and low belly pulling into the spine. Exhale to straighten legs up. The Pilates Ab Prep exercise is great to retrain hip flexor overworking and wake up your deeper abdominal exercises. Find a ‘neutral pelvis’ where your pubic bone & 2 frontal hip bones are all level and you could balance a cup of tea in the middle of your pelvis. There should be a small space under your lower back. Draw your chin towards your chest like you are holding an apple under your chin. Squeeze a little into the back of your armpits. Draw your ribs to your hips without changing the lower back. Your shoulders & head will lift off the floor, curving your upper back. Hold for a cycle of breath and check that the front of your hips are relaxed – give them a jiggle! Return to the ground with control. The below workout is great to prevent issues around the pelvis. 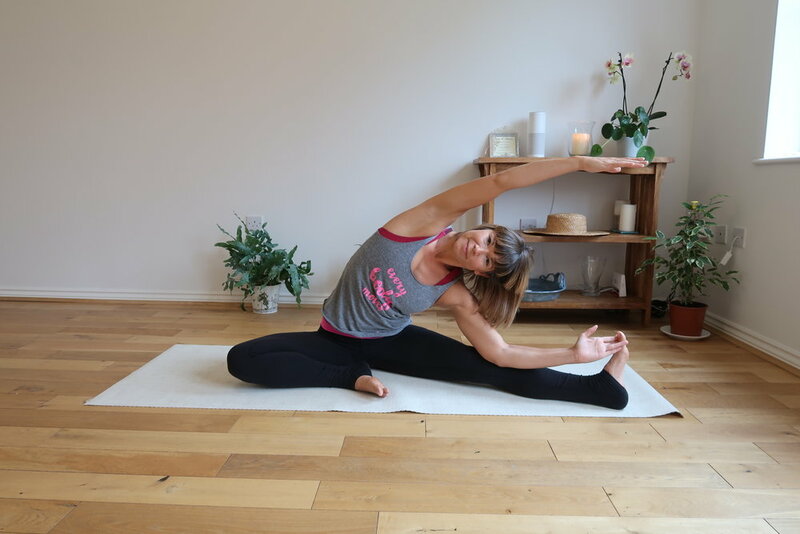 You can also try the Pregnancy sequence we made as this has a gentler glute workout and balances the needs for those in their second or third trimester. If you have specific issues that you would like to address our At Home programs can really support your development. Get in touch about how we can help you.